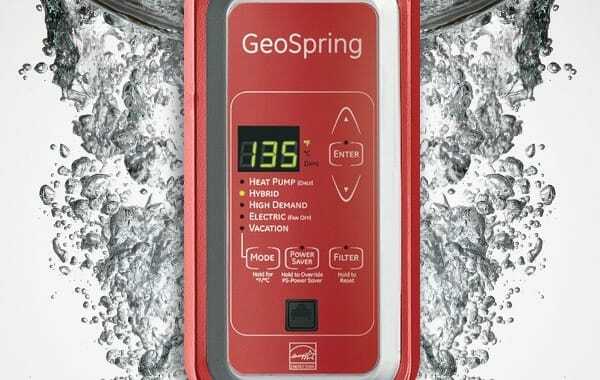 The GeoSpring hybrid water heater from General Electric features a 50-gallon unit capacity that has been designed to provide the same hot water recovery as a standard 50-gallon electric water heater with a 65 gallons first hour rating. Not surprisingly, GE’s device also features an ease of install that mimics the electrical and water connections standard electric water heaters offer. However, this is where the similarities end and the benefits begin. Unlike standard electric water heaters in the 50-gallon range, GE’s GeoSpring hybrid water heater uses as much as 62% less energy. DOE (Department of Energy) test procedures reveal the unit can save as much as $325 each year in expenses in comparison to these standard 50-gallon tanks (4879 kWh per year vs. the GeoSpring’s 1830 kWh per year). 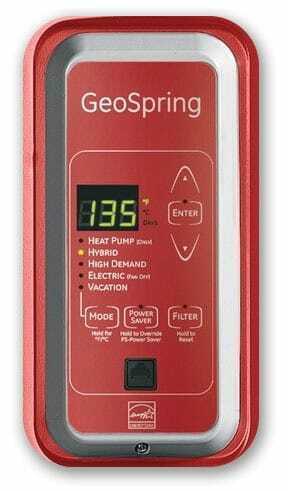 Additionally, the GeoSpring hybrid water heater features a 3 to 14 day “vacation setting.” Vacation settings are only found in newer, modern water heaters and allow for further energy savings by allowing the operator to activate the special energy-saving setting when they plan on leaving the house for an extended stay. The free-standing GeoSpring hybrid water heater is ENERGY STAR Qualified and also features a First Hour Rate (FHR) of 65 gallons, a LED control panel, washable air filter, and a 10-year limited parts warranty and 1-year limited labor warranty. The GeoSpring hybrid water heater operates at a quiet 55 DBA Average and bears dimensions (HxWxD) of 60 1/2 in x 21 3/4 in x 22 1/4 in. It is assembled in the USA.